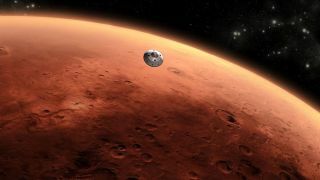 The first scheduled opportunity for the Mars Science Laboratory to tweak its trajectory on the interplanetary cruise from Earth to the Red Planet won't be needed for awhile, flight controllers announced Thursday (Dec. 1). The car-sized rover, packed inside the protective descent capsule, was successfully blasted off from Cape Canaveral last Saturday (Nov. 26) atop the powerful United Launch Alliance Atlas 5 rocket at 10:02 a.m. EST (1502 GMT). The Mars Science Laboratory, or Curiosity rover, rockets into space.